Birchwood Drive, Ravenfield, Rotherham, S65 4PT. 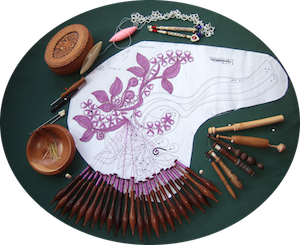 NOTE – Sheffield Lace Makers meet: Ecclesall Parish Church Halls. No tuition but teachers within the group will help with a problem. We usually work on our lace or other craft of the moment, chat with others, admire the goodies on a show table for items worked by members. We have a Newsletter “PILLOW TALK” sent out before each meeting, raffle, committee, library, trade stall (once a year), yearly competition for U.F.O.s and meet friends. Bring packed lunch or visit nearby eating places. Bring a mug – coffee & tea available for small charge.